and lots and lots of cake. On our first anniversary, we had some Chocolate Truffle cake my mom had saved from our wedding night. Thank goodness for moms, right? It hadn’t even occurred to me to save some wedding cake in the middle of all the excitement. I remember my mom giving me the cake the next day, and I (stupidly) just shoved it into the freezer without wrapping it properly. Well, it tasted pretty gross a year later. Surprise. I took one, maybe two bites before quitting. Mike finished it like because he isn’t one to waste cake. Especially a chocolate cake. On our second anniversary, I did a little better. I went to the bakery with the intention of buying the cake that we had cut: Chocolate Symphony. Unfortunately, I found out that these have to be pre-ordered (fail). So, I settled on another cake that we had at our wedding… we’re 90% sure it was the Turtle Torte. Apparently our memories are awful – we’re aging really, really quickly. Now, it’s our third anniversary, I’m avoiding dairy, and we’re two hours from Manderfield’s. 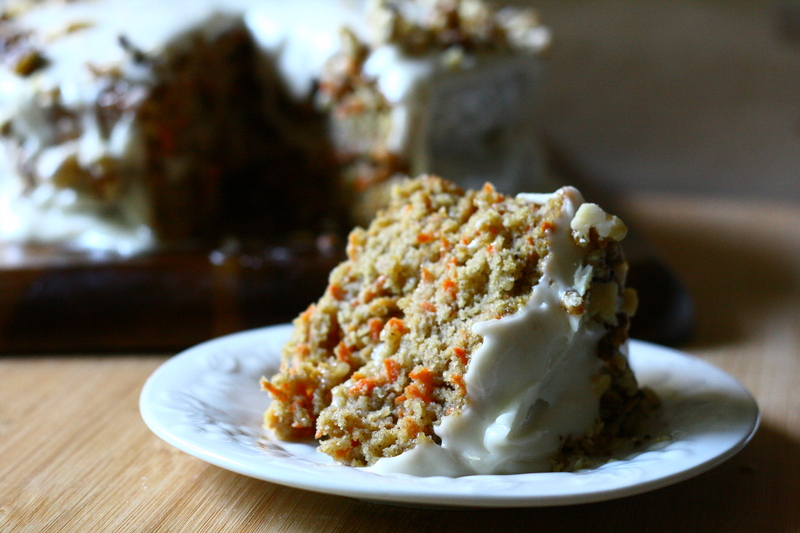 I wanted to continue with our tradition of eating wedding cakes on our anniversary, so I set off to create a dairy free carrot cake that was as good as our wedding carrot cake. Not an easy feat, I tell ya. But here’s what I came up with! Here’s to hoping that we have many, many more cakes in our future! Preheat oven to 350°F. Prepare two 9-inch cake pans by lightly greasing and lining the bottom with parchment paper. In a small cup, stir together lemon juice and almond milk. Let sit for 10 minutes. Meanwhile, in a medium bowl, whisk together flour, baking soda, baking powder, cinnamon, nutmeg, and salt. Set aside. In a large bowl, beat together eggs, sugar, brown sugar, applesauce, oil, pineapple and vanilla until well combined. Add in dry ingredients until just combined. Add in the carrots and stir until just combined. Pour batter into prepared cake pans and bake for 30 – 35 minutes, or until a toothpick inserted into the center comes out clean. Allow cakes to cool for 30 minutes in the pan on a wire rack. Carefully remove the cakes and peel off the parchment paper. Allow to cool completely on the wire rack before frosting. 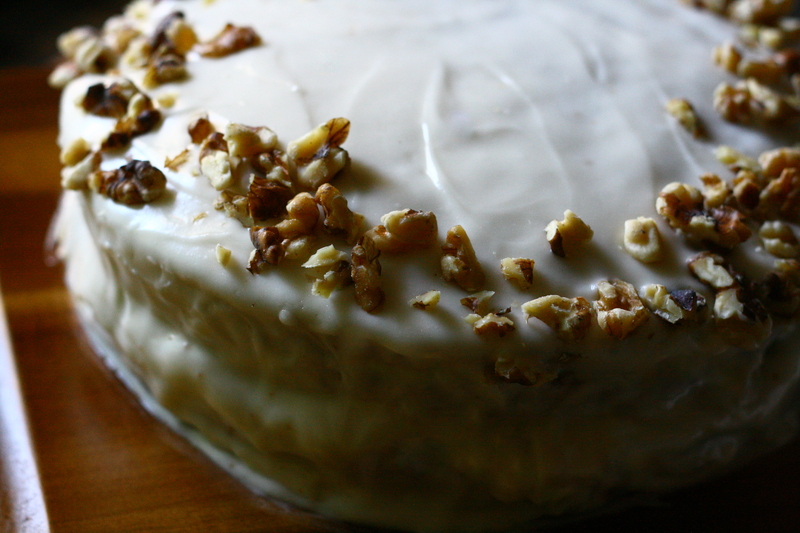 Sprinkle chopped walnuts on top of frosted cake before serving. 8 ounce container of dairy-free cream cheese, I used GO Veggie! In a large bowl, beat together cream cheese and butter until smooth. Add vanilla and beat until well combined. Slowly beat in powdered sugar, one cup at a time, until frosting is thick and fluffy. Categories: Cakes & Cupcakes, Dairy Free, Dessert, Special Diets | Permalink.